Dendrochronology is also known as tree-ring dating. It is a scientific method for analysing tree ring patterns to determine the exact date of a tree. By examining the actual patterns of growth, such as the gap between rings, it is also possible to see how the tree has responded to its environment. You can read more about Dendrochronology here. 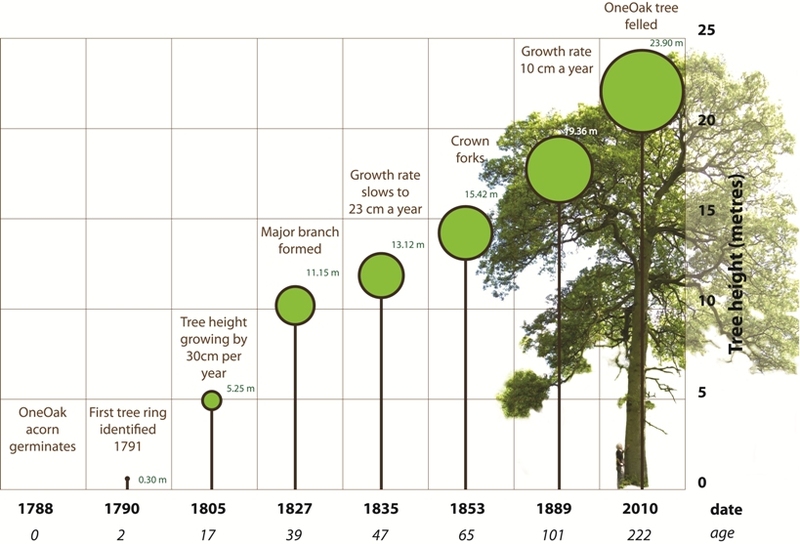 We worked with Oxford Dendrochronology Laboratory, to undertake a full dendrochronological analysis of the OneOak tree, from cross sections of the tree after it was felled. Leading dendrochronologist Daniel Miles, of Oxford Dendrochronology Laboratory, collected seven discs from the main tree stem and from one branch immediately after felling. Our original estimate that the tree was about 160 years old, based on estate records, proved to be very inaccurate. The lowest disc, taken about 30 cm above ground level, proved that the tree was 30 cm tall in 1790. The tree probably generated naturally in 1788: making it 222 years old when felled in 2010. A major branch formed in 1827, at 11 m above ground level, which grew normally for about 20 years until suffering a major trauma causing to cease growing for the next 30 years. This damage was probably caused by another tree or branch falling against it and injuring the branch. It is possible that another tree was felled in about 1847 which hit our tree, damaging the branch. The tree grew about 30 cm in height for the first 39 years of its life, slowing to 26 cm between 39 and 47 years, 23 cm between 47 and 65 years, and finally 10 cm per year between 101 and 222 years. Investigations are currently underway to link the dendrochronological record with the history of Blenheim Palace and woodland management on the estate.